D4EU is back from New Zealand! Many thanks to Prof. Dr. Raffaele Spinelli from our Italian Partner CNR Ivalsa for presenting us at the Forest Engineering Conference in Rotorua. Prof. Spinelli is part of the organizing Committee and summed up: “The event has been very successful. Over all, we recorded more than 150 participants, from 21 Countries.” Dr. Christoph Leibing from our Slovakian partner IKEA Industries Malacky gave a great presentation about the project D4EU, which must have inspired many of the industry people and forest engineering community present at the event. 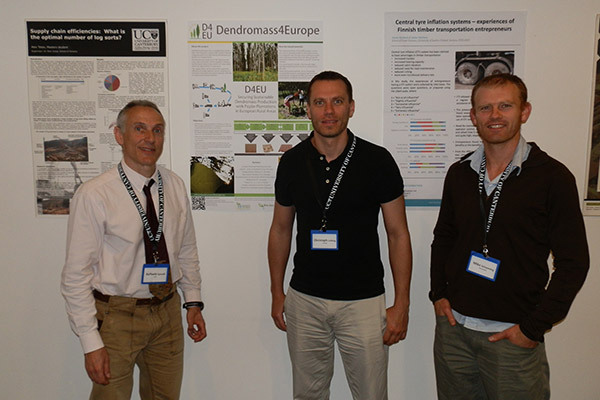 The picture shows Prof. Dr. Raffaele Spinelli, Dr. Christoph Leibing and one of the participants in front of the D4EU poster (from left to right).